Hollywood -- best known for its harmful Hollywood values and lack of intellectual achievement or productivity—is a district located in the city of Los Angeles, California. It is the historic base of the movie industry, although the studios have mostly moved out. 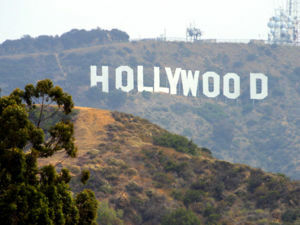 "Hollywood" now generally refers to the entertainment industry and its culture, which is based primarily in Los Angeles County. Hollywood is famous for its self-centeredness, liberal claptrap, and lack of independent thinking. Nearly all supported Barack Obama in robotic fashion. Robert DeNiro was no exception, insisting that Obama would "do better in the next four years." Writers such as Michael Medved, Michael Crichton and Ben Shapiro have criticized Hollywood. Balio, Tino. Grand Design: Hollywood as a Modern Business Enterprise, 1930-1939. (1993). 483 pp. Schatz, Thomas. The Genius of the System: Hollywood Filmmaking in the Studio Era. (1988). 492 pp. Vaughn, Stephen. Ronald Reagan in Hollywood: Movies and Politics. (1994). 359 pp. This page was last modified on 12 April 2019, at 18:01. This page has been accessed 30,304 times.